Powered by lead mines, Galena, Ill. was once a boomtown, the busiest Mississippi River port between St. Louis, Mo. and St. Paul, Minn. By the late 1850s, the northwestern Illinois town boasted a population of 14,000. In 1860, Ulysses S. Grant made Galena his home, moving there to work in the leather goods store owned by his father. But then severe erosion and siltation closed the Galena River to shipping, the Civil War broke out and Galena began its reluctant decline. Galena never regained its industrial impact, but has since found salvation in a Main Street lined with boutique shops, art galleries and gourmet food stores. These treasures are housed in the restored pre- Civil War buildings the town was once too poor to tear down. Tourism is now Galena’s chief commodity, one aided by a burgeoning wine industry and the recent resurrection of the town’s beer brewing roots. The hard-surfacing of U.S. Highway 20 (originally named U.S. Grant Highway) in the mid 1920s made Galena accessible to visitors, and it’s still a main road for more than 1 million tourists who travel to Galena each year. We made our temporary home at Palace Campgrounds, a 50-acre wooded campground set back off Highway 20, just two miles northwest of downtown. Founded in 1848, Palace is the oldest campground in Illinois but it’s been continually updated to offer plenty of modern comforts. Reservations are recommended to snag one of 74 RV sites — 22 with full hookups — and Palace can accommodate big rigs up to 45 feet in length. A heated swimming pool, 18-hole mini-golf course and playground with basketball court add to the fun. Palace also offers a dump station and coin laundry facilities, and is a stone’s throw from Wal-mart. Latin for lead sulfide, Galena was once part of a region producing more than 80 percent of the nation’s lead. The early 1800s brought another type of production to the town, this one in liquid form. 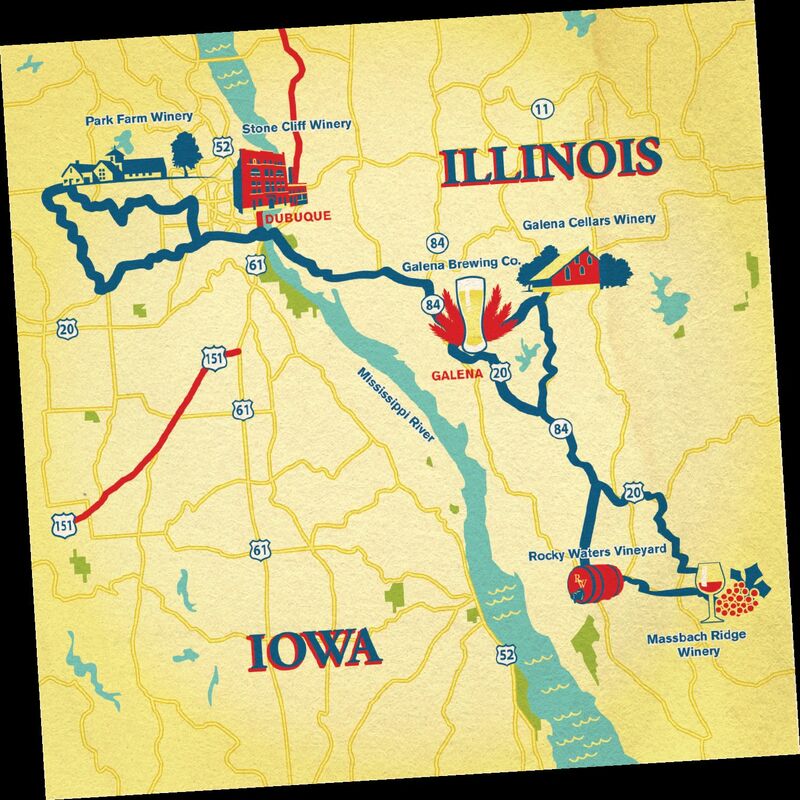 With nine breweries, Galena quickly became a prominent brewing town until Prohibition did its work and left just one brewery in its wake. Galena Brewing Company closed its doors in 1938 but its spirit — and name — lives on. Look: Wine isn’t just red or white. Maybe it’s ruby or maroon, golden or clear. Is it transparent, cloudy or opaque? Smell: Stick your nose into the glass and inhale deeply. Do you smell oak, berry, citrus, vanilla or floral notes? Gently swirl the wine and sniff again. Taste: Start with a sip, letting the wine roll around your tongue. Take in a wisp of air through your lips, letting it mingle with the wine to bring out the full flavors.